January weather has been cold, though not unbearable, with highs in the low 50’s and lows in the mid 20’s to low 30’s. While this can make for a brisk ride up river in the morning, good fishing has a fabulous warming effect! Fishing has been mostly good to very good, with occasionally challenging days as storms move through. 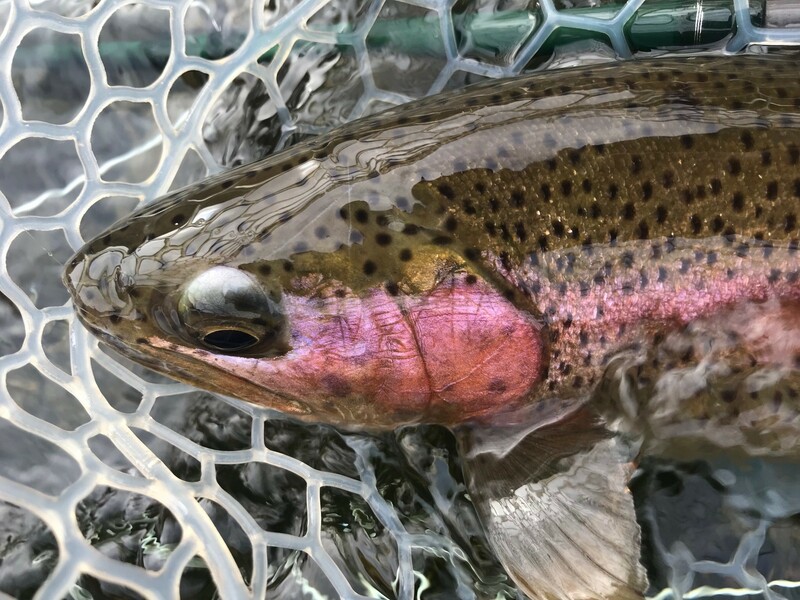 Rainbows are starting to spawn and are happy to munch a glo bug (Oregon cheese) in combination with a ginger scud. I hesitate to even mention that Lees Ferry has brown trout, as certain govt agencies are determined to eradicate them, but the browns spawned last month, finishing within the last 2 weeks. Clients have caught some amazing fish in the last month; many over 20″! When the powers that be decided to do another Colorado River November flood, many of us guides were concerned that having a fall flood would decimate the food source for the fish. Luckily the river was not as scoured as has previously happened, and the fish seem to have recovered well, and most are in great shape! This bodes well for a banner year in 2019! January water releases are exhibiting a “double peak”, where the flows are highest in early afternoon, and then decrease again, until peaking again towards midnight. These flows make for good fishing as the water comes up and often slows fishing as it decreases. The higher flows make wading challenging and long leader (12-14′) drift fishing is very productive. Spin fishing should stay good, and I’d recommend staying in the deeper runs below gravel bars with deep running lures and weighted plastic worms. Putting weight 2′ above the lure or worm works very well even though I know many anglers that fish lures are reluctant to add weight. My experience has been that bigger fish are caught when the lure is deeper. Just saying….